This Sapphire Radeon 4850 graphics adapter supports what’s called CrossFire. If you have two PCIe slots on your Motherboard, you can install two of these cards and get 8x outputs. NVidia has a like type of technology called SLI. 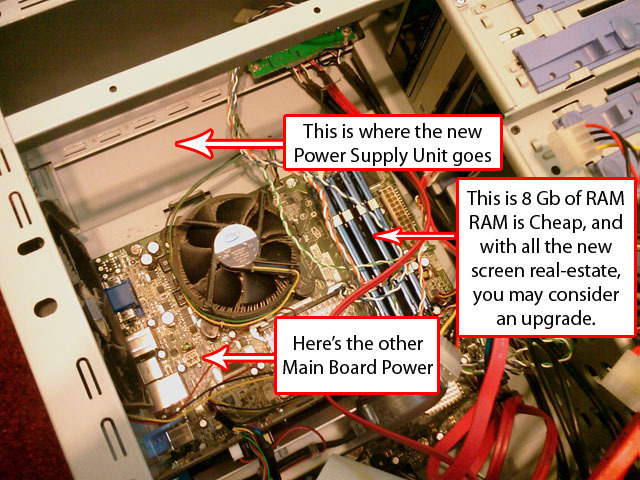 The catch is that your Motherboard must also support these and that you will require at least 1 KW (1000 W) of power via your Power Supply Unit. I’ll only install one card in this demo, which brings us to the first issue. Problem #1: Installing a card that requires such power (for 4x displays) requires at least 650 W from your Power Supply Unit (PSU). 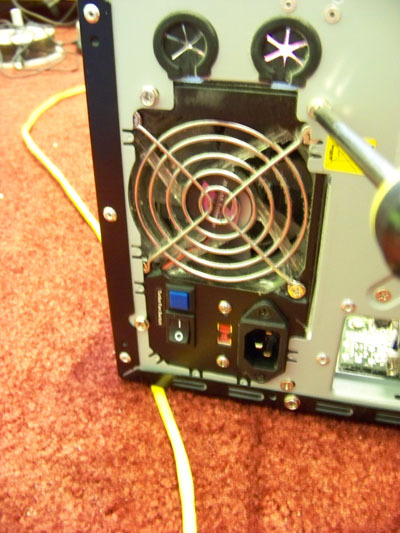 I only have a 500 W PSU inside and I do not want my machine blowing up from not enough throughput (really, it would just sputter and not turn on). 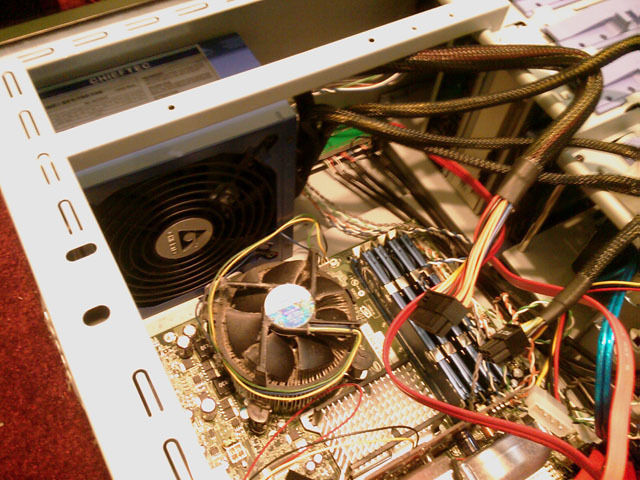 So the first thing I needed to do to my system was completely rewire the power inside the box with an upgraded PSU. Well, lets get started! It’s time to turn off your computer and open it up! Fortunately, my system is custom, so opening it up is made very easy. If you have an OEM system (premade from DELL or HP), it may be a bit more tricky to get in, but you should still be able to do everything you need. 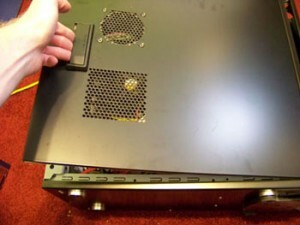 Screws are usually on the back of the case and a single side (on the left) should be able to open. Sometimes you have to pull the front-panel off before this and the side can either slide off or pull out. BEFORE touching anything inside the case, please discharge your figures by touching a metal grounded object. You need to be wearing a ground to your wrist. That was easy! Now, lets identify a couple of items inside the computer. 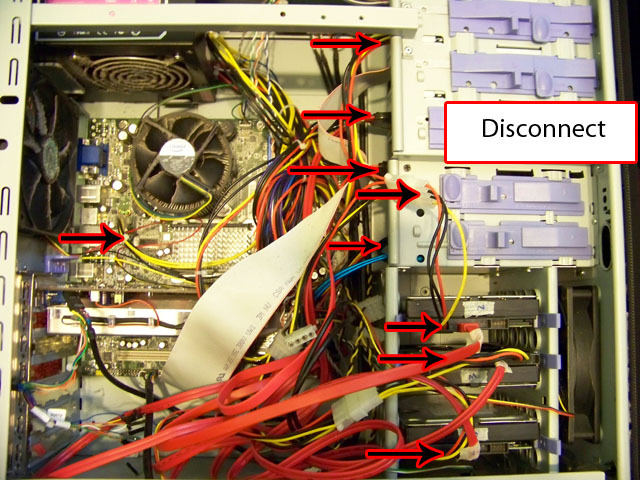 Look for the Power Supply Unit (a black box) and see all the “Yellow, Red, Black” wire couplings? We are going to remove all of these and replace them with a completely new set. 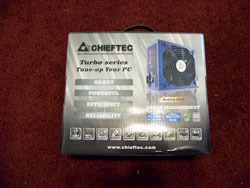 First, lets open up the new Power Supply Unit and see what it’s all about. 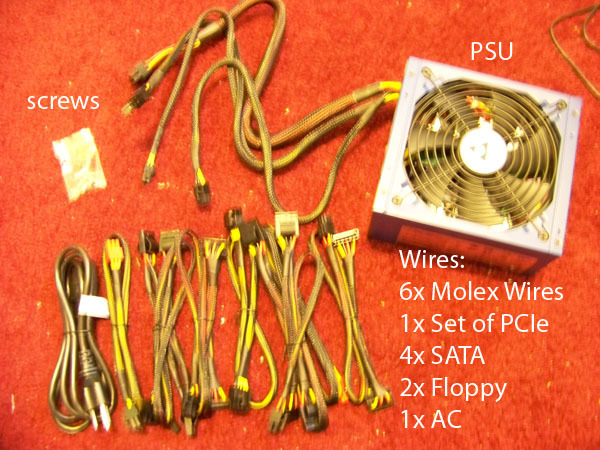 Ok, here is the new PSU and its new set of wires. 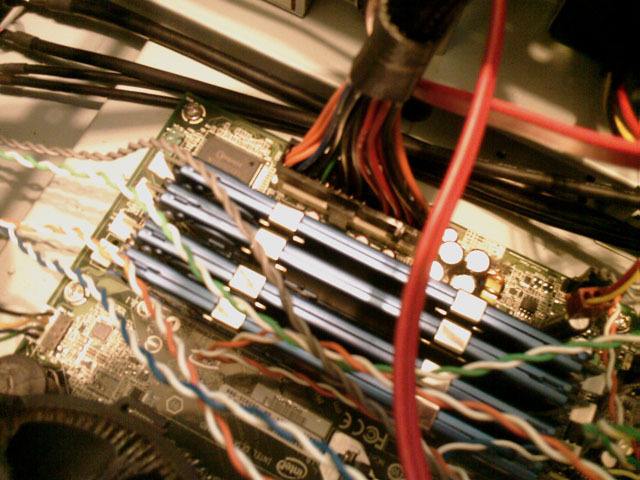 Now, these wires have nylon outfittings so it makes it a lot easier to move around and less likely to split open on you. The wires are very easy to figure out what goes where and what plugs into what, if it doesn’t fit, it doesn’t go! But, there are adapters so simply visit your local computer store if you are having some issues. But, everything should be here. 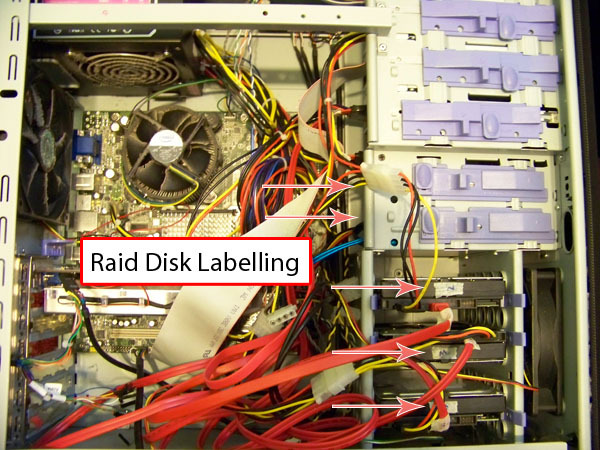 Before you start unplugging thigs, you may want to label what’s inside of your machine, ESPECIALLY RAID Hard Disk setups. I have 5 hard drives in my system connected to S-ATA cables, so before I did anything (actually when I first installed them), I was sure to label each wire and each corresponding disk with some masking tape. Now follow your hand from the Power Supply Unit and anything that it is connected to, simply disconnect. There are a lot of these inside here, it’s pretty easy as long as you remember to re-connect them. There is sometimes also another Main Board connector close to the Chipset Processor (the second to largest one, which usually has a heat-sink on top of it). I’ll have a better picture once the PSU is out. 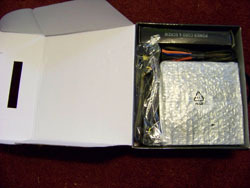 Now go to the back of the case and unscrew the PSU from the casing. Ok, now we’ve got the PSU out of the case. Yes, that’s right, 8Gb of RAM to hold all the programs for 6 monitors. 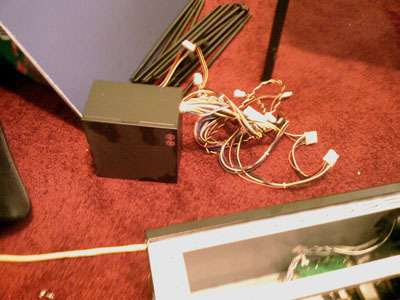 Here’s the PSU all removed… That wasn’t so tough? Was it? Now, lets put in the new PSU and hoook everything back together. The next few photos will take care of the Key elements. 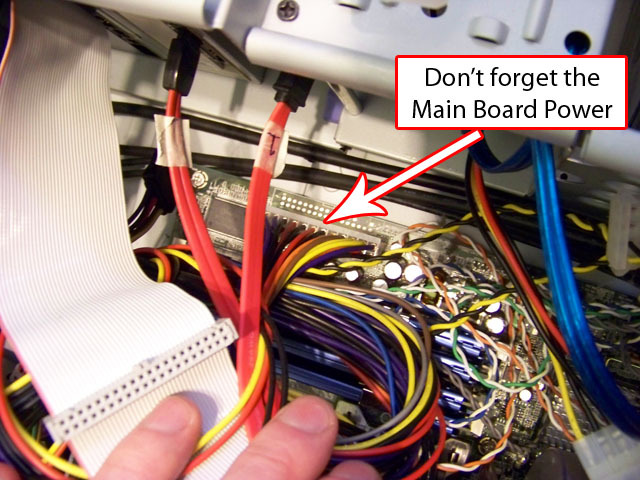 Also, do not forget your DVD/CD drives, Hard Disks, Floppy’s, Your 2 Main Board connectors (some only have one) and anything that may have come unplugged in the process. Take special note of the following picture. 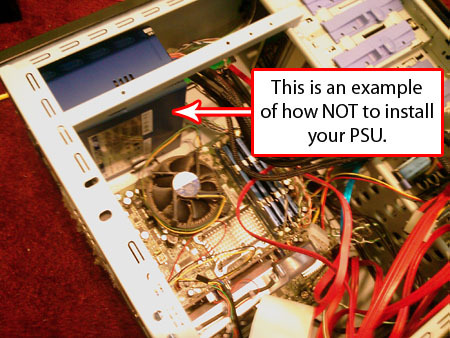 This is the wrong way to install your PSU. Remember to keep the FAN positioned down, otherwise all the heat will simply collect and you risk further damage. Fortunately, many cases do not allow you to install it this way, so you will know if something is up. And most importantly, do not forget your mainboard power supply connections. Ok, that should have taken you probably an hour, maybe a couple, depending on how many times you’ve done that before. I always suggest going slow and making sure you have everything setup correctly. I’d also recommend powering on your machine to see if everything is still ok. This way, if you need to troubleshoot anything, you know that the only thing that has changed is your Power Supply. 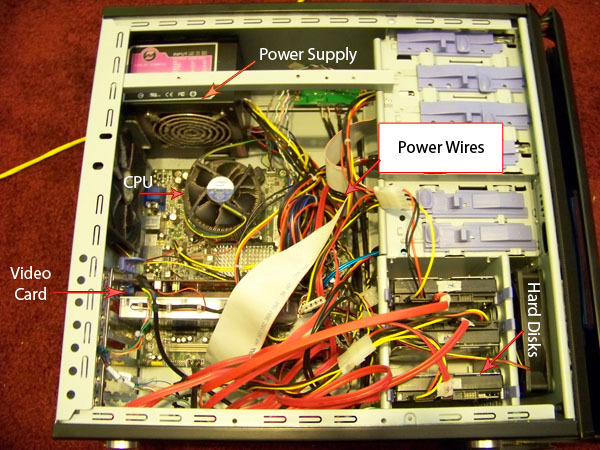 There are no drivers needed for a power supply and really the only problems that you may have is if something did not get reconnected. 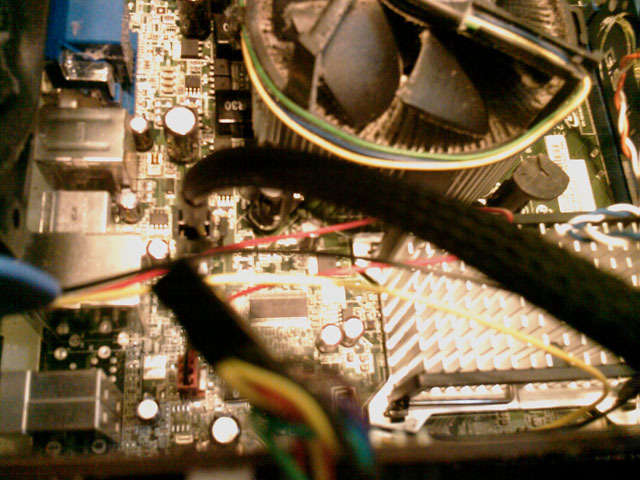 If it will not boot at all, check the main board connectors. Also, make sure the switch on the back is flipped to 1, not 0… get it, 0 – Off; 1 – On. Ok, you probably either just accidentally unplugged your Hard Disks power again, or their IDE or S-ATA connectors. Go back in and make sure these are all secured. Lets move on to the Graphics Card Installation. Need to know a few things about your Gateway. Does it have a PCIe x16 exnipsaon slot, and does the case have enough room in it for a full sized dual width card? Many of these pre-builts are built on non-standard platforms that make upgrading difficult or impossible. If your PC has the slot and the room for it, the ATI Radeon HD 5770 is a VERY capable card and priced right at about $170.00. Will pretty much take everything you can currently throw at it plus DX11 capable.BTW400w PSU is marginal for a high performace video card, if you have ther means, I’d recommend upping that to 750w or better if you plan on upgrading for awhile without replacing the PSU every time. 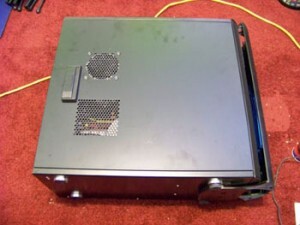 This was actually a custom case, yes it did have a PCIe x16 expansion slot. Also, the dual width card would have to be “made” to fit also. Notice, I literally cut at the metal of the case, where the hard disks are supposed to go for the length of my card. I agree with you on the 750W+ PSU. Also, today we are lucky to have so many people playing with multiple monitors, even with things like Cross-Fire and SLI (look these up), you can stick in multiple video cards and hook them together. Very cool stuff.